See the prior post and our B. J. Stone trade card. 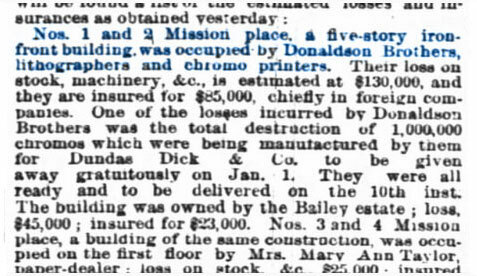 Donaldson Brothers was a very successful lithography and printing company which ran from about 1872 to 1891 before being consolidated with the American Lithographic Company. According to Frank’s obit appearing in the weekly publication American Stationers, it was Frank who founded Donaldson Bros., and this may be correct, but we wouldn’t want to assume, since this is a statement from one source. Our short write-up on this litho firm is just skimming the surface with a few details, as in-depth would be quite time-consuming. 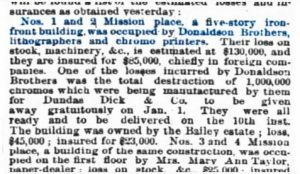 In any case, the firm was Frank J., George W., John L. and Robert M., all born in Edinburgh, Scotland of parents John Donaldson and Barbara Hume (Montgomery) Donaldson. The family emigrated to the U.S. in 1856. The 1860 Federal Census finds the family living in Brooklyn, NY. The 1878 New York City directory shows all four brothers as lithographers at the address of 2 Mission Place, New York, which was in the Five Points neighborhood in Lower Manhattan. 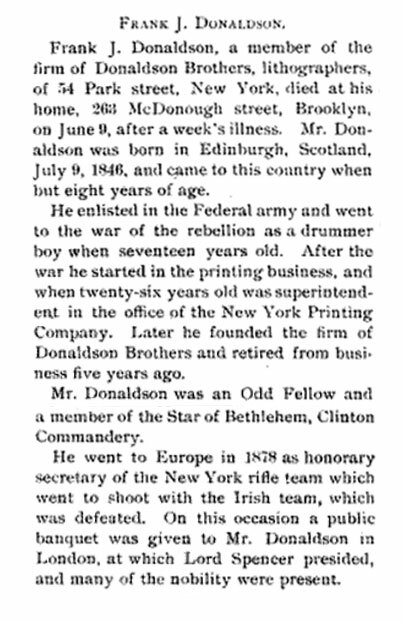 Below, Frank J. Donaldson’s obituary appearing in American Stationer, June 1896. 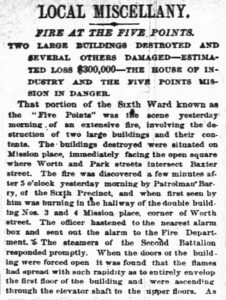 Below, a couple of clips from a lengthy article from the New York Times on the fire in Five Points that took place December 9, 1875, from which, of course, the company rebuilt (with improvements). Sources: Donaldson Brothers 1872 – 1891 “D – Publishers.” MetroPostcard. (accessed November 4, 2017). Trow’s New York City Directory, 1878. Vol. 91, p. 356. (Ancestry.com). Year: 1880; Census Place: Cranford, Union, New Jersey; Roll: 800; Family History Film: 1254800; Page: 201B; Enumeration District: 171. (Ancestry.com). Sons of the American Revolution Membership Applications, 1889-1970. Louisville, Kentucky: National Society of the Sons of the American Revolution. Microfilm, 508 rolls. (Ancestry.com). George William Donaldson. Find A Grave Memorial# 63258205. Findagrave.com. 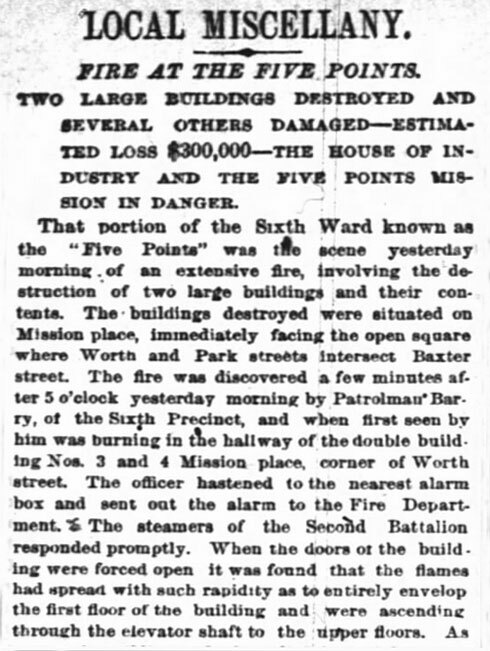 “Fire at the Five Points.” New York Times, December 10, 1875. Friday, p. 8. (Newspapers.com). 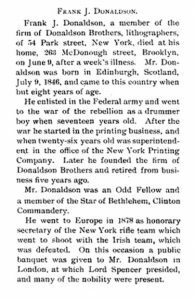 This entry was posted in Lithographers - D and tagged American printers and lithographers history, Donaldson and Montgomery family history New York and Scotland, Scottish emigrants to New York in the 1800s by Annieoakley. Bookmark the permalink. Very nice write-up with useful primary sources. Thank you! Fun fact: Donaldson Brothers acted as lithographers for Buchner Gold Coin Tobacco Company when they created some of the very first baseball cards in 1887. They’re known as series N284, and also featured the likes of then-famous actors, horse jockeys, police officers, and fire chiefs. Thanks Jesse, and thanks very much for the extra info! That’s unexpected regarding the police officers and fire chiefs. Makes me wonder if litho companies in other parts of the country were doing the same. I have a very large lithograph that has been framed and titled, The Christian Graces.. faith hope and charity. It is signed Donaldson brothers Five Points New York. I purchased this at an auction many years ago in New York . Just thought I’d add that information if there is any interest. It is approx 32” x 21” not including antique frame. Thanks Beth, just to make sure….it’s 32″ x 21″ not 32″ x 31″? I’m looking for any information on, what I believe, is a print. The title is “Comrades”. The copyright date is 1893 by Donaldson Brothers,NY. The print is 14″ X 28″ and it’s mounted in a wooden gold frame. Is it worth anything? Hi Jim, You’d probably want to bring the item to an antique dealer or auction house for an appraisal. Plus the frame might add to the value somewhat, depending on age, style and condition. Sorry I can’t be of more help, but best of luck!